My older son dislikes the reboot of Star Trek because of some of the liberties they take with the laws of physics. I on the other hand am happy to allow artistic license in order to have a good story. Of course, I grew up on the notoriously under-budgeted original Star Trek, while he grew up on Star Trek Deep Space Nine. The original couldn’t afford the sets and models for a different planet each week, so they created the now ubiquitous transporter. Considering that this was in the days before the first real world moon landing, that was a leap of faith (or a tweak of physics) in its own right. On the other hand, there are some great stories that take great care in ensuring that the science is reasonably well adhered to. 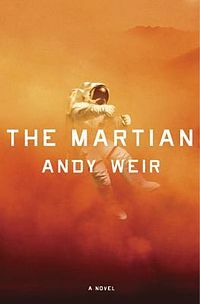 I just finished The Martian by Andy Weir. There have been marooned stories from before Robinson Crusoe to the recent movie Gravity. The trick is to tell it in a way that’s reasonably plausible. Mark Watney is part of a team of astronauts on Mars that is devastated by a dust storm. His team mates see him impaled on a metal rod and blown away, but can’t recover his body because their launch vehicle is rapidly succumbing to the same storm. Recover one dead astronaut and they’ll add the whole team to the killed in action list. Of course, Mark didn’t die, but to survive he has to figure out certain things. How do I get water on Mars? How do I find some way to grow some kind of food in something? Like a detective novel, it’s the “how does he figure this one out” factor that makes this book fun, and there are many things to be figured out. This entry was posted in Arts, Communications, Education, Fiction, People, Philosophy, Science, Space, Technology, Television, Writing and tagged Martian, Science fiction, Weir. Bookmark the permalink.